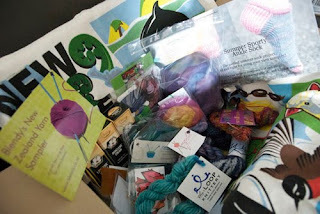 Here is a quick peek at one of the many boxes going on sale tonight at 9pm - yikes just over an hour to go! All boxes are different, and each contains 13-15 awesome yarns, accessories and patterns, all wrapped up in a cool NZ themed tea towel. I've been waiting for these - I'm a bit of a Needlefood addict after discovering Michelle and her stash of awesome wool at Craft2.0 last year. Also, since every parcel of Needlefood yarn that arrives contains a chocolate, my 4 year old son assumes that ALL wool parcels should contain chocolate and he has been rather disappointed this week with so many parcels arriving without treats!! Or just go buy some now at www.needlefood.co.nz while you nervously wait for the sale time on Saturday night and Sunday morning! I'm sorting through all the amazing samples that are about to be made into NZ Yarn Sampler boxes, and I came across the first samples I got and thought you'd appreciate a reminder. I know it's not knitting related, but it is from New Zealand, and I'm sure all knitters would love to try some NZ Skincare products! In my 'other' life, I'm a nutritionist and naturopath at www.absolutehealth.co.nz, and my friends at Comvita have donated some wonderful UMF18 Manuka Honey skin treatments - EVERY BOX will contain a Lipclear Cream (great for coldsores as it also has lysine in it, SkinClear Cream (perfect for problem skin) and Skintensive Cream (to help with scar healing), and a sachet of Huni Every Day Cleanser. 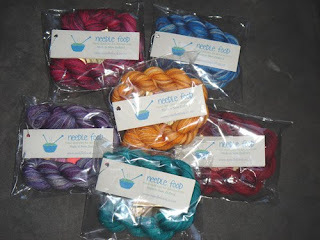 This set of products retails for $42, so this is an amazing bonus addition to our NZ Yarn Sampler Boxes! Crafters looking for a source of unusual and beautiful fibres can find what you need at Inspire Fibres. 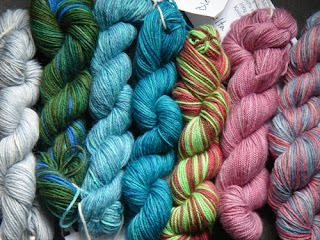 Tracy has supplied a couple of different fancy yarns for you to experiment with - hand dyed tussah silk, and also shiny Italian style silk throwsters. The silk throwsters are yarn waste from silk spinning mills and are 100% silk. It can be hand spun into textured yarn, or use it as accents in your spinning. You can even make silk paper, or add textural interest to the surface of handmade felt. It's also ideal for using in projects with the dissolve-away cloth and stitching. The inspiring creative possibilities are endless! Have fun playing with this beautiful silk, and email Tracy for more information on what she has available. 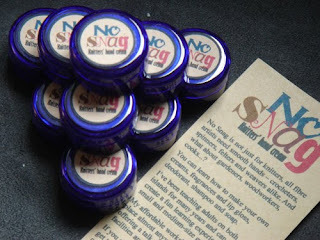 No Snag Knitters Hand Cream Samples! "I've been teaching a Make Your Own Lotions And Potions course for many years, but had never attempted to make a cream specially for extremely dry and chapped hands. So I set out on a bit of a quest to create one that would protect my hands from the ravages of hot water and harsh detergents and keep them smooth and soft for crafting. 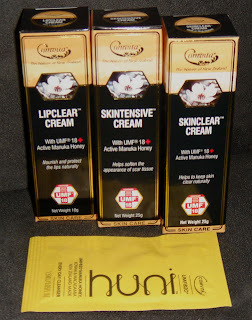 For No Snag I don't use any chemical nasties or animal-derived ingredients and the cream is tested only on crafty hands. It is fast absorbed and doesn't leave a greasy sheen. No Snag is also very economical - a little goes a long way - and it smells nice. The subtle vanilla scent is a little flowery and quite "clean". It is not overpowering and doesn't linger too long, either. No Snag is not just a hand cream - because of its simple formula it can be used for rough heels, as a facial moisturiser for very dry skin, body butter or baby cream. The cream contains water, rose water, a blend of vegetable oils, shea butter, plant-based emulsifiers, wheatgerm oil, cocoa butter, tincture of benzoine and a blend of pure essential oils." Wow, what an exciting box of goodies! There are so many beautiful samples, I don't know where to begin. Sabine from Curiouser and Curiouser makes yarns for the adventurous crafter, and of course any good crafter has a wide selection of yarns in their stash, so when you find that perfect pattern you must begin immediately, you are sure to have just the yarn for it. Sabine's lovely samples are all one-off's so make sure you use it for something really special! 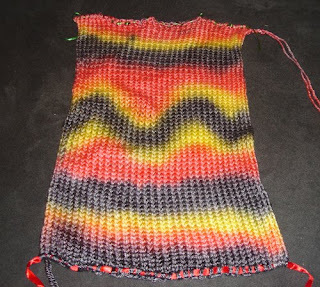 Enjoy it as an example of the amazing yarns she creates. 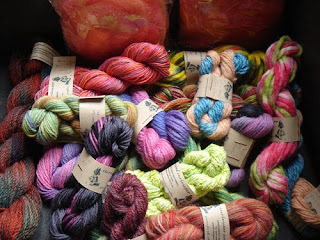 She is working on a really nice repeatable series of hand painted merino, so be sure to contact her for more details. These beautiful samples have come all the way from Alaska! 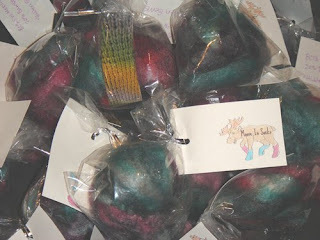 Moose In Socks are one of our specialty international suppliers and have sent cute bags of Merino/Bamboo fibre called 'Hidden Gems'. It is so soft and shiny with the bamboo through it, and what an amazing colour. Yes, I really must learn to spin! And look what else I bought from Moose In Socks - this is the most ingenious idea for sock knitting - a hand-dyed sock blank. What's that you ask? Let me tell you, and you'll be dazzled! Two threads of yarn (in this case baby size merino/tencel, OMG, so smooth!!) are machine knitted together into a rectangle. THEN, they are hand dyed, each one unique. Now, the amazing trick to this is, that when you unravel it, you then have two threads of yarn the same length with exactly the same colour markings so your socks will MATCH. Wow. And, if you are super clever, you can knit two socks at the same time and unravel the square as you knit! Don't have anything like that in your stash? Well, you can hardly NOT have it now that you know this amazing technique. Quick, head over to Moose In Socks' Etsy store and buy one to test out for yourself! 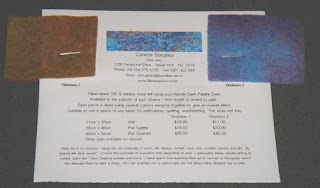 Here are some cute samples from Carlene Douglass who is a Fibre Artist at www.fibrepassion.co.nz. 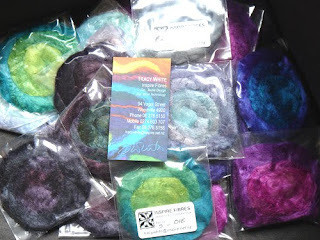 She makes hand-dyed 100% merino wool felt to be used for embroidery, quilting, and needle felting. Eco-friendly Earth Palette Dyes are used, with several colours merging together to give a blended effect. And, you can order them in any colour you like, so they will be perfect for your next project. The sample includes two thicknesses. Need some now? You can order from Carlene at cdouglass@paradise.net.nz.